The newly launched indoor vertical farm Bowery merges tech and agriculture for sustainable, local greens. Forward-thinking artists have conceptualized the idea of vertical farming for decades. In art books and theoretical architecture websites alike, renderings of futuristic societies integrate efficient farming into office and residential buildings. You’ve likely seen such interpretations—soaring glass glowing green with acres of verdant crops. They’re architectural wonders that optimize the space above the building’s footprint, making them especially suited for urban environments where arable land is limited. Vertical farms of this capacity seem like the stuff of science fiction—and in many ways the self-sustaining glass megaliths are, as the The New York Times once put it, "more theoretical than practical so far." But a rising number of startups are launching vertical farms that grow crops in stacks to save space and energy, and to provide a truly local food option for people living in cities, regardless of the season. We’re not talking local as in 100 miles away—we’re talking the next borough or block over. Related: Narrowing the farm-to-table gap in Jackson Hole, Wyo. The New York City-based indoor farm Bowery, which grows a variety of lettuces, herbs and microgreens, hopes to better serve restaurants and retailers local, healthy produce that is reliably available the entire year. If you want fresh lettuce during a New York winter, chances are that it is harvested in Southern California or Mexico and shipped across the country, harboring a high carbon load due to transportation. Bowery is different. "We grow in a completely controlled indoor environment and we used LED lights that mimic the spectrum of the sun. We are able to grow 365 days of the year independent of seasonality," says co-founder and CEO Irving Fain. The vertical farming operation also uses 95 percent less water than traditional farming and no pesticides. 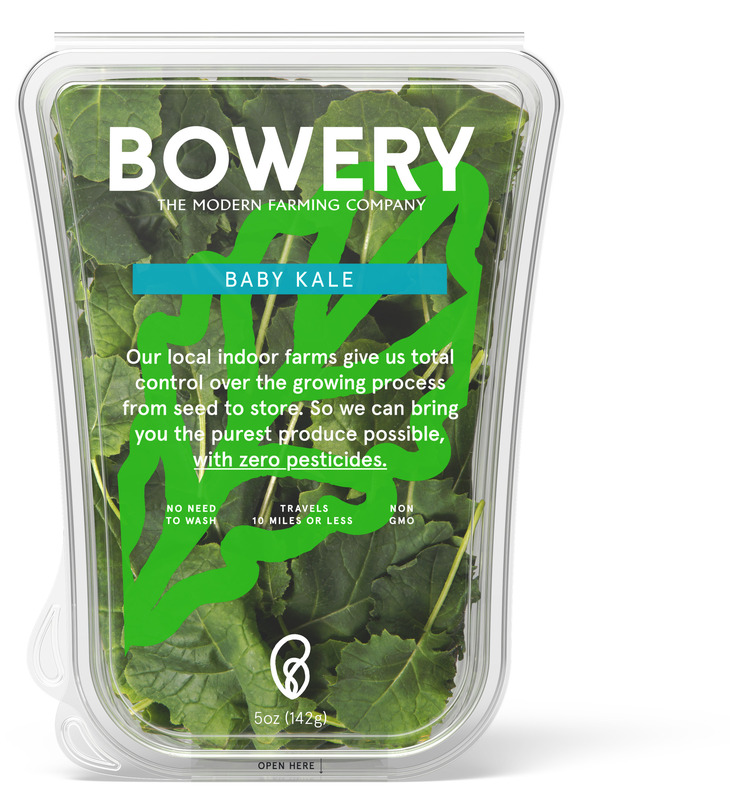 Bowery is first and foremost a food producer—celebrity chef Tom Colicchio is an investor and has featured the company’s unique crops like ultra-spicy mustard greens and wasabi arugula in his New York-based restaurants, Craft and Fowler & Wells. But Bowery is, in many ways, a tech startup. The company’s small staff includes agricultural scientists and engineers dedicated to data-driven farming to optimize yield, plant quality and taste. Proprietary software, called FarmOS, employs machine learning to calibrate the farm. Machine learning, for those who aren’t software engineers, is a way of programming a computer that provides the framework for making its own decisions. For example, Bowery’s software can learn what specific alchemy of nutrients, water and light can make plants either sweet or bitter, mild or spicy—a boon for professional chefs and home cooks alike—and understand these measurements for future harvests. You've likely experienced machine learning in your daily life without even knowing it, as the technique is often employed in digital ads that cater to your preferences or image recognition used on Facebook. "We’re a vertically integrated organization," says Fain. "We control the process from seed to store. We build the farms. We build the technology. We want to ensure that we grow the highest quality product possible." Bowery is funded like a startup, too: Fain and his team have raised $7.5 million in a seed round lead by First Round Capital. It’s clear that Bowery’s farming model has potential to help alleviate food supply pressure. Global population is rising, and the world’s arable land may not be able to sustain the projected 9.7 billion people living by 2050. Fain is quick to clarify that one solitary operation is not sufficient to move the dial on improving global food access and supply. While Bowery is currently focused on widening the farm’s reach in New York City and the tri-state area, engineers made their model scalable in order to eventually expand into other cities—a great benefit to Northern areas where growing crops year-round is impossible. To be clear, Bowery is not the first vertical farming operation out there. Jackson, Wyoming, an isolated ski resort with an extremely narrow growing season, recently saw the construction of Vertical Harvest, a massive (and multi-million dollar) indoor farm housed in a former parking garage. Likewise, Kimball Musk, founder of the Boulder-based restaurant group, The Kitchen, spearheaded a Brooklyn-based urban farming accelerator called Square Roots designed to teach emerging farmers how to grow two acres worth of produce inside a shipping container. Forward-thinking groups across the country like Bowery are embodying the value of alternative growing systems for a sustainable future. Talking with Fain, and fresh off of reading The Martian (Crown, 2011), a novel (and also a movie) about an astronaut botanist stranded on Mars, I mentioned that Bowery’s operation could one day be employed in space travel. "Actually," he said, "we have a couple of people on our team that have worked on NASA-funded projects." Sophisticated indoor farming, it seems, is science fiction no more.